Sick from a virus and generally pretty miserable the last few days…but still quasi-willing to pose for me. (First things first: Remember to say the “Glama” with a New York accent). 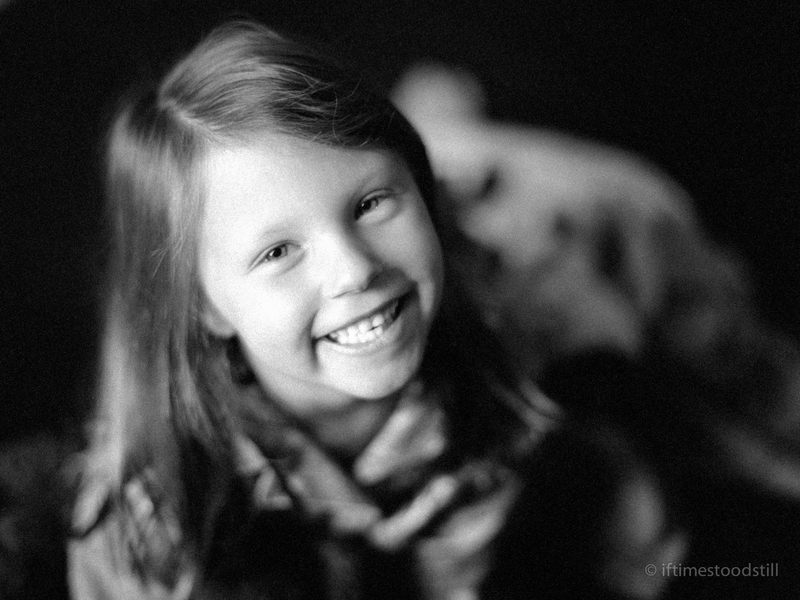 Shot on Delta 3200 at ISO 1000, so it is a tad grainy…A dark floor and a single window was all we used here. I really like delta 3200 in medium format…grain or no grain, the results look good to me! Would there be less grain at 3200? Unfortunately no…Delta 3200 is, by nature, a very grainy film. Despite the misnomer, its base ISO is really only 1000; shooting at 3200 is actually a near two-stop push. At 3200, the grain would be about the same (or slightly increased) with slightly MORE contrast, and slightly LESS tonal gradation and response. It is, nonetheless, a very intriguing film, as it does allow you to shoot indoors with wanton disregard! If I shot TriX 400 pushed 3 stops is there a problem with development times? I’ve never seen the results of Tri-X pushed to 3200 (I know Delta 400 holds up fairly well…) but it is certainly possible. What are you planning to develop it in? You are definitely going to end up with a grainy and contrasty image! From what I have seen – both from Delta 3200 and pushed 400 speed films – the pushed films are superior in their ability to hold detail. And, of course, they can be 400 speed films, too, at no penalty. I used to think I understood photographic film. I still am not a guru but damn have I learned a lot. Most of what I have learned should have been basic knowledge. I dismissed negative film for so long – I think that was the reason. Slides were the thing before digital came along. Negs were for newspapers; slides were for commercial, fashion, stock, landscape and National Geographic: ‘serious’ work. I will show you later but in 1985 (I was 9 years old then) photographers were pushing Fuji 400 colour neg film by three stops with very usable, albeit grainy, results. Some knowledge is no secret but it never makes it to the mainstream. That is partly why I’ve been so surprised by what I’ve learned. You have certainly raised some interesting and valid points. Thanks for the link on the Tmax push–that is indeed quite remarkable (3200 from 100…wow!!). I am not sure an equivalent push would be feasible on a color film due to the “shonky” colors introduced (analog “noise” of sorts…) but 3 stops is certainly within reach. Now the only question which remains: Why AREN’T you actually using film?? Actually no it’s quite simple. I don’t take a lot of photos TBH. Only when I have to. It’s easy to do work for other people, but for oneself? And I’m not really fretting over maximal quality either. If I’m shooting film for me I won’t mind if I just scan for web quality; if it’s for somebody else, I can deal with that when it happens.